Will the Stock Market’s Tech Rout End Like the Dot.com Bust? ← Are the Big Banks Putting a Gun to the Head of the U.S. Consumer – Again? If that statement is true, then the $2.3 trillion that the U.S. stock market vaporized over the past two months is nothing for investors to worry about. But if the market is not efficiently directing capital, if it’s a system where everything from stock research, to high frequency trading, to Dark Pools, to over-the-counter derivatives, to revolving-door regulators is rigged to benefit insiders, then buckle your seat belts for the wild ride that’s coming. The reality is that careful Wall Street watchers have known for at least two decades that the rigging of Wall Street has resulted in it being the antithesis of an efficient allocator of capital. In 2001, Ron Chernow described for New York Times’ readers how Wall Street’s deeply conflicted model had brought on the dot.com bust. Chernow wrote: “Let us be clear about the magnitude of the Nasdaq collapse. The tumble has been so steep and so bloody — close to $4 trillion in market value erased in one year — that it amounts to nearly four times the carnage recorded in the October 1987 crash.” Chernow compared the Nasdaq stock market to a “lunatic control tower that directed most incoming planes to a bustling, congested airport known as the New Economy while another, depressed airport, the Old Economy, stagnated with empty runways. The market functioned as a vast, erratic mechanism for misallocating capital across America,” Chernow observed. “First, Wall Street brokerage firms issued knowingly false research reports to the public to trumpet the growth prospects for a specific company; second, the firms lined up big institutional clients who were instructed how and when to buy at escalating prices to make the stock price skyrocket. This had an official name inside the walls of the manipulators: ‘laddering.’ Next, managers of the fleets of stockbrokers at the various brokerage firms instructed their flock to stand pat as the stock prices soared. If the stockbroker tried to get his small client out with a profit, he was hit with a so-called ‘penalty bid,’ effectively taking away his commissions on the trade. This sent the clear warning to other stockbrokers to leave their clients in the dubious deals. Only the wealthy and elite were allowed to capture the bulk of profits on these deals. The CEO of Citigroup, parent of Salomon Smith Barney, was Sandy Weill during this era. He was never charged and retired as a billionaire as a result of his obscene compensation at the Wall Street bank. In 2008, that very bank collapsed and received the largest taxpayer bailout in U.S. history. Nothing was clawed back from Weill. 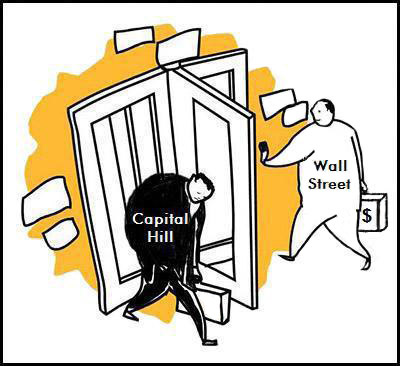 Today, there is an abundance of evidence that Wall Street’s dubious practices have resulted in an unprecedented misallocation of capital. Take the case of Amazon. The company is just two decades old. Amazon is currently trading at a price-to-earnings ratio (PE ratio) of 300.92 as of yesterday’s close. A PE ratio of 20 is considered the historic norm for stocks trading at the upper band of value. In addition, Amazon pays no dividend to placate investors through rough times. But somehow, without a cash dividend and trading at wild multiples, it has managed to have a stock market value of $664.19 billion and rack up a 54 percent return over the past 12 months. Amazon’s biggest problem isn’t that President Donald Trump doesn’t like its CEO, Jeff Bezos. Amazon’s biggest problem is that it is a poster child for the misallocation of capital on Wall Street, along with many other Nasdaq stocks. Consider Amazon’s numbers versus those of Procter & Gamble, a company that has been around for 181 years, is one of the oldest components in the Dow Jones Industrial Average, pays an attractive dividend of 3.56 percent, and has a stable of top household product brands like the century-old Ivory soap, half a century old Crest toothpaste, and other iconic names like Bold, Tide, Bounty, Pampers, Gillette, Charmin and numerous others. Procter & Gamble is trading at a reasonable price-to-earnings ratio of 19.31 but it has lost 11 percent of its stock market value over the past 12 months, giving it a market cap of $195 billion, which is less than 30 percent of Amazon’s market cap. Clearly, there are market forces at work here that, once again, have corrupted Wall Street and perverted its primary role as an efficient allocator of capital. But don’t expect any help rooting out the corruption from the U.S. Senate’s Permanent Subcommittee on Investigations, which unearthed so many of the Wall Street scams of the past under the capable leadership of Senator Carl Levin. As we previously reported, that Subcommittee has been flipped on its head under Republican leadership and is devoted to investigating government abuse of corporations. Editor’s Note: Pam and Russ Martens have long-term holdings in Procter & Gamble. We have no exposure, short or long, in Amazon or in any of the Wall Street banks which we cover regularly.